Posts related to HAPS governance, including the Board of Directors and the Steering Committee. I hated pep-rallies in high school and I have always struggled with having a sense of team spirit. In fact, at Christmas time I find that I tend to have more in common with the Grinch than Old Saint Nick, so the fact that I find myself excited enough to write a blog about something is not only out of the ordinary, it’s stranger than green eggs and ham! As one can imagine, I have surprised myself over the last four years at how I have become such an advocate (dare I say cheerleader) for the Human Anatomy & Physiology Society with both university administration and my fellow anatomy colleagues. It has been exciting to interact with the diverse population of individuals who teach A&P. Our educational backgrounds vary just as much as our personalities and teaching styles. In contrast to other professional organizations that I participate in, I have found that HAPS creates a uniquely inclusive environment in which professionals from a range of institutions and at all stages of their career can share their ideas and learn from conference speakers, workshops, and online forums. Furthermore, like the Grinch, I find my heart growing three sizes when I think of how our leadership team is constantly looking for new ways to work with the different HAPS committees in order to find how we can help one another become better scientists and educators. With the intention to assist with this initiative, the HAPS Cadaver Use Committee has recognized a problem faced by a significant population of HAPS members. We have found that many of our members have very little or sometimes no cadaver dissection experience. In response to the perceived need and interest amongst the HAPS membership, the Cadaver Use Committee is developing a human cadaver dissection mentorship program. Specifically, we are soliciting member interest and need for this program. Additionally, we are looking to identify individuals that can serve as mentors. The role of the mentor will be better defined as we continue to collect information from HAPS members through virtual town-hall meetings and a survey to determine interest by location, limiting factors, cost, and the type of mentorship relationship that will provide the most value added for participants. Long-term, we would like this dissection mentorship program to fulfill the pillars of a faculty’s academic career. Our goal is to develop a mentorship program that will not only enrich the quality of teaching, but also bolster faculty promotion, tenure, and service. With all that being said, I would like to say I am grateful for HAPS and proud of this initiative. I am excited to share my lab and my dissection experience with my colleagues. I may not be ready to hold hands and sing “Welcome Christmas” with all the Who’s in Whoville, but I can’t wait to hear from others in my region and the greater HAPS community and learn what they think about our new program and how they might like to participate. Please pay special attention to any upcoming emails regarding the human dissection mentorship program. We would love to hear from you at any of our upcoming town hall meetings or surveys! Kelsey Stevens is the Anatomy Lab Manager and an Instructor for Rocky Mountain University of Health Professions. Her specialties include Human Anatomy, Physiology, and Embryology. She has been a member of the HAPS Cadaver Use Committee since 2016. Last fall, the HAPS Board approved a new task force on Diversity and Inclusion Goals (DIG). The purpose of DIG is to develop best practices, resources, and professional development for inclusive education in anatomy and physiology (A&P). The endgame is transformation of ourselves, where we create the best learning environment for all the learners we serve. Why should you “DIG” it? The mission of HAPS is to promote excellence in the teaching of A&P. On a professional level, educators need to understand diversity, inclusivity, and equity. This allows us to competently talk to and teach our students as well as create a classroom environment conducive to learning for all. In addition, we must adapt our approach in and out of the classroom to the increasing diversity of identity groups in our student populations. These identities include gender identity, sexual orientation, age, socioeconomic class, religion, ability, preparation level, ancestry, and fluency in English, and any one of these identities can be barriers to learning for our students, and impact us as educators. HAPS is poised to be a leader in generating materials to explore diversity content within anatomy and physiology courses as well as create inclusive classroom environments. Our classrooms are spaces where diversity conversations are deeply relevant, and there remains a critical need for exploring diversity within the context of science and connecting science to society. To be culturally competent within their field, students must be exposed to diverse viewpoints and alternative ways of thinking. Engaging others who hold different ideas and experiences raises awareness of their own identities and opens new approaches to problem solving. As society changes, new questions arise in the classroom that are relevant to A&P, such as the application of big data to health records, how assisted reproductive technologies should be used, controversies over animal dissection, and many others. Additionally, HAPS members train future health providers and scientists, putting us in the unique position to shape healthcare and biomedical science. Want to “DIG” into the work? Consider presenting a workshop at the Annual Meeting! We would love to see how HAPS members create inclusive and diverse classrooms and curricula. What does an inclusive A&P class look like? How does a professor convey that they are committed to student safety and success regardless of the student’s identities? What types of content or activities provide students with experiences that help them flourish? What advice do you have on handling mistakes in the classroom gracefully? How do you accommodate students with disabilities in your lecture or labs? What role do textbook authors and vendors play in shaping inclusive curricula? Take the upcoming Diversity and Inclusion Membership Survey! With a release date in May 2019, DIG hopes to gather membership data that will tell us who we are as an organization and identify needs in diversity issues. Share your ideas! The HAPS blog, HAPS Educator, Discussion Boards, and Teaching Tips Site are all great places to contribute your ideas and engage with colleagues. Look for our information table, poster, and workshop at the 2019 Annual Meeting. We’d love to chat with you! Or feel free to contact me if you’d like to learn more. Kathy Burleson is a Senior Lecturer at Hamline University, where she teaches in the Biology, Exercise Science, and Public Health programs. She is the lead of the HAPS Diversity and Inclusion Goals Task Force. This post comes from the Communications Committee Talking Points Coordinator, Dr. Krista Rompolski of Drexel University. The HAPS Annual Conference is less than a week away. I told my students the other day that for an A&P professor, this is Woodstock. They didn’t quite understand, but I’m sure you all do! This is the one event of the year where we can share our unbridled enthusiasm about the human body with people who feel the same, and don’t mind if you talk dissection over dinner. Watch for this notebook in Ohio- add your thoughts and doodles, then get a chance to WIN IT on Monday afternoon! Keep the notebook for no longer than one hour (if you have it in your possession after 10pm, keep it safe until the following morning). Include your name, and where you are from. If you would agree to have your contribution shared in the conference wrap up publication, please put an asterisk after your name. I will take some photos of the submissions with asterisks and share those in a conference wrap-up blog post! If you get the notebook and don’t want to participate, please randomly pass it along. But please pass it to someone you don’t know! We want to connect new HAPSters! On Monday afternoon, whoever has the notebook at 4pm should return it to me, where the door prize drawings will be taking place. If those directions change due to conference timing or needs, I’ll indicate that in the front of the notebook. One lucky HAPSter will be randomly selected from the door prize pool to go home with this fun collection of HAPS memories/tips/stories! I can’t wait to see what we come up with, and what we have to share! See you all in May! 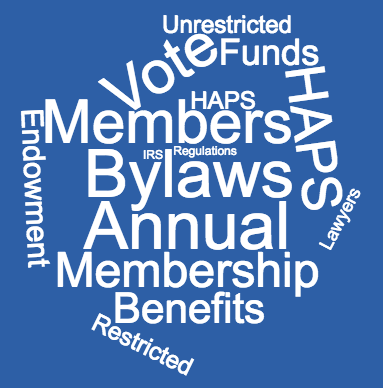 This year the HAPS board has focused on clarifying our financial instruments and has completed a top-to-bottom review of our policies, procedures, and bylaws. This sort of work is detail oriented and can drag on, but is necessary for organizational efficiency. Some of the things that the board found during this process were surprising and some were reassuring. All of the findings reaffirmed the fact that HAPS is in a strong financial position and is focused on ways to help members far into the future. The proposed set of revisions to the bylaws will increase financial transparency, clear up some confusion about past donations, and improve financial management. We’ll vote on these revisions at the Annual Conference in Columbus Ohio on May 29th, during the general membership meeting. So what was reassuring about our finances? HAPS has grown its donated funds from essentially zero in 2009 (when fundraising began) to nearly $120,000 today. All these donated funds, and the interest generated from them, have been left untouched since at least 2013 to facilitate growth (HAPS has been funding scholarships out of the operating budget since 2013). Now that we have a sizable nest egg, the next step is to create a management and spending plan that is both sustainable and prudent. Through the proposed bylaws revisions, the HAPS board has created a new committee to do just that – the HAPS Finances Committee will provide guidance to the board on the management of both donations and general savings. So what was surprising? Despite talk of a foundation for years, it turns out that no foundation was ever formally created – and apparently, that is a good thing! A foundation is an body that is formed around some problem or idea. A foundation is not specific to a single organization. For example, one might form a foundation to cure cancer and then give the foundation’s money to anyone working to cure cancer (not just to one institution). Obviously, HAPS donors never intended to give money to HAPS only to have HAPS give that money to a separate foundation. The HAPS “foundation” was just a misunderstanding of the terms being used, but the idea of supporting HAPS via donations is alive and well. So what is changing in the bylaws? There are three main changes. First, we will be following the suggestions of our attorneys and removing article 17 from the bylaws. This is the article that specifies a foundation and a bunch of other overly complex financial structures that HAPS does not need. Second, we will be establishing a restricted endowment to properly channel some past donations. And third, we will establish the aforementioned Finances Committee to advise the board on proper management of all HAPS funds. If you’d like to brush up on some of those terms, check out the glossary in the “lots more info” tab in the 2018 conference app. None of this is as exciting as HAPS Synapse! or any of the Update Speakers or workshops or posters, but governance has its place at an annual meeting. Hopefully we’ll see you there! Many of us in HAPS have been fortunate to have learned human anatomy either by dissecting human specimens or by working with already dissected bodies. Many of us now teach students using human cadavers as the primary specimens for study in the lab. Beyond that, the anatomical knowledge of the general population results from investigations performed on dissected humans in the past. How many of us have ever considered where the dissected bodies came from? Probably very few; many of us can take for granted the present level of anatomical knowledge. Where these long-gone anatomists obtained their specimens never enters our conscious thought. There is a rich history of human dissection dating back to before the start of the Christian era. There are references to human dissection, cadaver investigation, or funerary practices in Egypt, Persia, Babylonia and India that extend back in time over four thousand years. Even then a pattern emerges indicating that those with the least and those guilty of crimes bore the burden of serving as specimens for dissection. There was even a brief period shortly before the Christian era during which human vivisection was practiced on criminals in Egypt. Over the span of time, bodies have come from multiple sources including debtors, societal outcasts, the mentally ill and strangers, recent unclaimed dead, anatomical oddities and even victims murdered specifically to serve as dissection specimens. Bodies obtained by “entrepreneur” grave robbers throughout the Renaissance and continuing well into the nineteenth century in Europe and America were the primary supply of bodies for dissection, with bodies stolen from the easily accessed burial sites used by families with few or no real financial assets, and rarely if ever from the much more secure cemeteries of the rich and privileged. Death mask cast of William Burke and a pocket book made from his skin; Burke was executed in 1828 for murdering people and delivering their bodies to medical school in Edinburgh. During the nineteenth century in Europe, donation of bodies by family members became legal as a way for the poor to eliminate funeral expenses. In Tasmania, genocide of the aboriginal population in less than a century largely benefited bone collectors back in England. In America, a booming business in the bodies of African slaves and freeborn blacks signaled another low point in this narrative. Finally, the successful heart transplant performed in 1967 by Dr. Christian Barnard in South Africa triggered an increased interest in organ transplantation and the importance of organ and body donations. The result was the passage of the first Uniform Anatomic Gift Act in 1968, creating a sustainable system based largely on altruism to provide for both the needs of the transplant community and those of anatomy and medical education. Hopefully this narrative that chronicles the thoughtless and often diabolical events of the past will spur those of us involved in anatomy and medical education to consider and appreciate the unwilling sacrifices of so many in the past that made the current state of anatomic knowledge possible. As educators, we should play a role in acknowledging, even briefly, this history to our students and the debt of gratitude we owe to so many who have been so wronged in the past. Bill Perrotti is a HAPS President Emeritus and a professor at Pennsylvania State University.